Heat oven to 350 F. Line 24 muffin cups with paper liners. In a medium bowl, whisk flour, 1 cup of sugar, the baking powder, baking soda and salt until blended. In a large bowl with electric mixer, beat eggs, orange zest, vanilla, and orange extract until blended. Beat in 1 cup vanilla sugar. Beat in oil, then buttermilk, until blended. On low speed, beat in flour mixture just until blended. Spoon about 1/4 cup batter into each muffin cup. Bake 25 to 28 minutes until wooden pick inserted in center comes out clean. Remove to wire rack to cool completely. Beat cream cheese, vanilla, orange extract and orange zest in a medium bowl with mixer on low speed to blend. Add confectioners’ sugar, a little at a time and beat until fluffy. Beat in orange food color (if using) until light orange. Refrigerate until firm enough to spread. 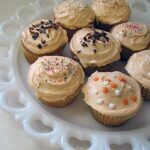 This recipe for Orange Creamsicle Cupcakes was printed from AmandasCookin.com - https://amandascookin.com/orange-creamsicle-cupcakes/ and can only be printed for education or personal use.